I've been exploring using the CNVnator program from Mark Gerstein's lab. to identify copy number variations (CNVs) in a genome. This program analyses the read depth in a bam file of short read sequence data mapped to a genome assembly, and tries to identify regions that have unusual read depth and so might correspond to copy number variations. To use CNVnator, you must specify a 'bin size', or window size. CNVnator then divides the genome assembly into nonoverlapping bins (windows) of this size, and uses the count of mapped reads in each window as the read depth for that window. In the CNVnator paper, they use 100-bp bins (windows) to analyse data from a trio from the 1000 Genomes Project. In the case of the 1000 Genomes Project, the reads are from an individual sequenced as part of the 1000 Genomes Project, and are mapped to the human reference genome. In my case, I am using CNVnator to look at reads from a particular species, mapped to the assembly for that species, where we suspect that there are uncollapsed haplotypes in the genome assembly, which should be detected by CNVnator as putative 'deletions' (regions of read depth < 1). 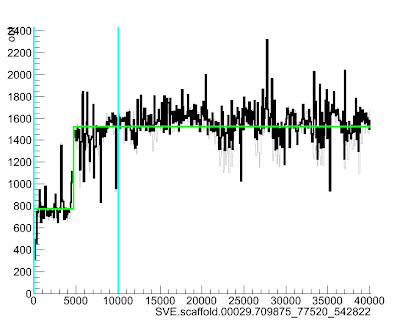 It can also find potential 'duplications' (regions of read depth > 1), which could be due to collapsed repeats. The CNVnator paper says that it is harder to find potential duplications than potential deletions, and I find that in practice it tends to identify fewer potential duplications than deletions. In the CNVnator paper, they say that CNVnator can identify CNVs from a few 100 bases to megabases in length. Furthermore, the precision is good: 200 bp for 90% of the breakpoints in a test case studied in the CNVnator paper (using a bin size of 100 bp). The higher the coverage you have, the smaller the bin size you can use, which will give you greater precision. They recommend to use ~100-bp bins for 20-30x coverage, ~500-bp bins for 4-6x coverage, and ~30-bp bins for 100x coverage. However, they say that the bin size used shouldn't be shorter than the read length in your data. You can download CNVnator from the CNVnator download page. (iii) individual fasta files for each scaffold/chromosome. I find that CNVnator needs you to have individual fasta files for each scaffold/chromosome in the current directory. As well as this, CNVnator seems to stall if the fasta files have a lot of characters per line of sequence (eg. 1000s of characters), but this was solved by reformatting my fasta files so that they had just 60 characters per line of sequence (using my script reformat_fasta.pl). where /nfs/users/nfs_b/bf3/bin/CNVnator_v0.2.7/src/ is the path to where you have installed CNVnator. This step seemed to require quite a lot of memory (RAM). For a 419 Mbyte RAM file (6,138,830 100-bp reads), this needed 1.5 Gbyte of RAM. It took about 25 minutes to run. The '100' at the end is the bin size (window size) that you want to use. This step takes less than 1 minute to run. I think this step is to calculate statistical significances (p-values) for the windows that have unusual read depth. Here the '100' at the end is the bin size (window size). This step only takes a few seconds. This step partitions the chromosomes/scaffolds into long regions (each one of which could be longer than the window size) that have similar read depth, and so presumably similar copy number. Again, the '100' at the end is the bin size (window size). The README file for the CNVnator program says that this is the most time-consuming step. It took just a few seconds to run in my case (on one scaffold). This step finds potential CNVs. Here the '100' is the window size. I have redirected the output to the file 'out.100.cnvnator'. Again, this just took a few seconds to run. p-val1: is calculated using t-test statistics. p-val2: is from probability of RD values within the region to be in the tails of gaussian distribution describing frequencies of RD values in bins. Strangely, I find that some of the p-values in the output file are greater than 1, which they obviously shouldn't be if they are really p-values. I'm not sure why this is.. 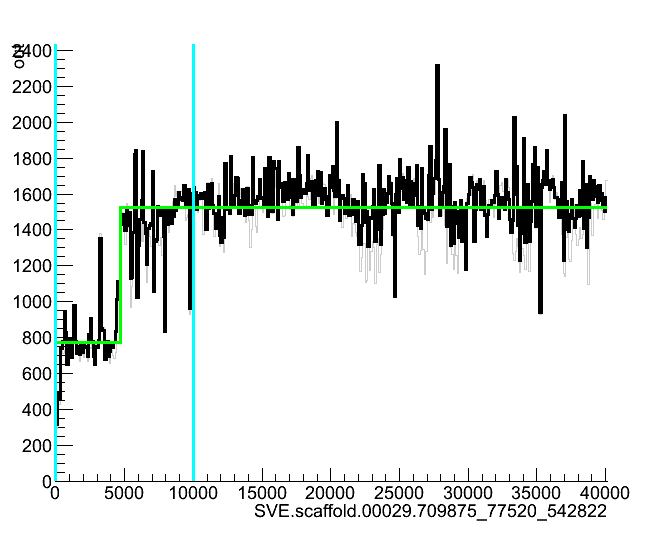 Here the green line goes up suddenly at position ~4700, suggesting that the read depth (and so copy number) increases quite a lot at that point in the scaffold. Thanks to Bernardo Foth for a lot of help and instructions for running CNVnator (most of the above was worked out by Bernardo), and to Alan Tracey for example data. It takes a bit of time to paste in all the above commands, so I've written a simple wrapper script to run CNVnator on an assembly, run_cnvnator_on_assembly.pl. This will be useful to Sanger people only: if you want to run CNVnator on an assembly relatively quickly, it is useful to divide up your assembly into smaller subsets, and run each subset on a separate farm node. I have a script to do this, run_cnvnator_on_farm_wrapper.pl. It submits the jobs as a LSF 'job group', so that only 100 jobs run at any one time. For each job, it requests 3.5 Gbyte of RAM. A very useful blog to find out the Copy Number variations in genomes other than humans through CNVnator! at the end of step 3) it's supposed to be "BAM file" and not "RAM file"
How to save the canvas image via command? Instead of viewing it separately, its better to save the image for each view and study them. Image can be save via File menu but how to do it via command only? This has been tremendously helpful. Thank you. I am having trouble interpreting the analysis output though. Are there any available tutorials/guides on translating the histogram and statistics that you could recommend? This blogpost is very useful! Thanks for posting. And you're script in perl has been a huge help. I however encounter this problem every time I try and do the histogram step. No, I'm afraid that I haven't seen this before. I'm wondering if whether you have run out of memory (RAM) or disk space, as the error message says 'Maximum buffer size exceeded'. Perhaps you can divide your input data set into smaller pieces? Thanks for posting this blog. However, i have some problems on running the perl script run_cnvnator_on_assembly.pl. When i run this script, it shows an error: Can't exec "reformat_fasta.pl": No such file or directory at run_cnvnator_on_assembly.pl line 129. From what I understood from www.ncbi.nlm.nih.gov/BLAST/tutorial/Altschul-1.html this makes a real difference for not significant results. In other words p-values close to 1 will correspond to e-values greater than 1. Significant e-values would be interpreted just as p-values are. Thanks for this post btw! It was really useful. How do i get genome coverage for each window ?. Where does the bin_XXX directory was created. I see final significant deletion/insertion event only. How do i get the whole genome coverage for each sliding window ?.